When I package my game as a debug build ( 64 bit ) I notice that slate/umg has trouble rendering 2 images on top of each other that belong to the same widget. So the setup is something like an overlay with 2 images as children. All you see is an white image. The all white image indicates that it's missing from the package. Some how the cooker couldn't determine that it was needed. Anything special about it? It got fixed when I deleted some UNUSED slate brushes. The one in particular that I suspect might have had wrong import settings( set to skybox for some reason ). But the odd thing was that it wasn't used in any of my widgets but it still messed up the other widgets. Ok after 2 days I can confirm that it seems pretty much random. Everytime I package some other widget turns white. Hmm, can you post/send the package/cooking logs? Maybe there's something in there. Thanks! Do you happen to know the name of the texture and the brush that didn't load from this particular cook? I'm going to try to build a test case to reproduce this, are your textures just in slate brushes/styles, nothing else special about them? And the weirdest thing is, that it seems totally random. Sometimes NONE of my widgets will look proper but then when I change/edit/delete anything in ANY widget, the others will start to work. Sometimes just 1 randomly breaks. Very odd. Thanks for helping out! I'll today if I can replicate the problem in a fresh project and send it to you. Cool will take a look. Yeah if you manage to replicate it that would be awesome. We're also seeing this issue with UMG. Random textures appear as white. Do UMG textures get packed into atlases? Are there hard limits on atlas size for UI items? 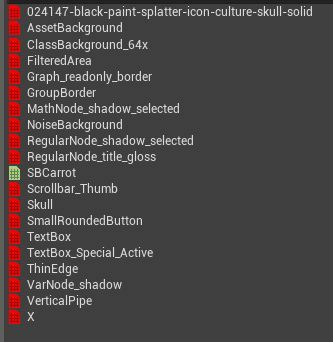 Interestingly, this happens on cooked builds on iOS but not on our direct-to-device builds for Android - all UMG textures appear correctly when we package a build to Android directly from the editor. They're not atlased currently, it's a performance issue we're going to need to tackle soon'ish. What you might be seeing is the textures failing to load because they are non-power of 2. You can work around it by making them uncompressed textures, TC_EditorIcon in the texture details panel on the I think compression property.